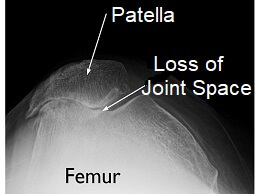 Patellofemoral arthritis is where there is degeneration and inflammation of the bone and cartilage at the patella (kneecap). Kneecap arthritis causes stiffness and pain at the front of the knee (anterior knee pain) and makes activities such as kneeling, climbing stairs, walking on slopes and getting up from sitting difficult and painful. It may develop gradually over time as part of the aging process or following an injury such as a fall or recurrent dislocations. Here we will look at the different aspects of patellofemoral arthritis including what is going on in the joint, the common causes and symptoms, how it is diagnosed and the various treatment options, both surgical and non-surgical. Let’s start by having a quick look at the anatomy of the patella so we can understand what goes wrong with patellofemoral arthritis. The patella is a small bone, shaped like an upside down triangle embedded in the quadriceps and patella tendon. It sits in a dip at the front of the femur (thigh bone) known as the trochlear groove or patella groove forming the patellofemoral joint at the front of the knee. As the knee moves, the patella glides up and down the trochlear groove. Both the back of the patella and the trochlear groove are lined with articular cartilage, a smooth, elastic tissue that allows the bones to glide over each other with minimal friction. In fact, the cartilage on the back of the patella is the thickest cartilage found in the entire body, averaging around 4mm thick. In patellofemoral arthritis, the cartilage on the back of the patella and in the trochlear groove become worn and inflamed. The cartilage thins and frays and if the wear and tear is severe it can expose the underlying bone. In an attempt to protect itself, the body may lay down extra layers of bone, known as bone spurs. The smooth surface is gradually lost leading to bone rubbing on bone. This can be painful and may limit movement. In the picture here you can see changes that develop in patellofemoral arthritis. The LEFT image shows a normal knee – note the space between the kneecap and the femur. The MIDDLE image shows the loss of joint space due to arthritis. The RIGHT image highlights the bone spurs that form. Cartilage gradually thins as part of the normal aging process. Degenerative patellofemoral arthritis (known as osteoarthritis) usually affects those over the age of 65. 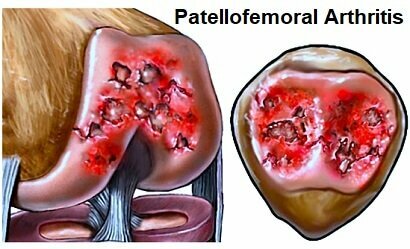 The most common symptom of patellofemoral arthritis is anterior knee pain – pain at the front of the knee. The pain tends to be worse with activities that place pressure through the kneecap such as going up and down stairs, kneeling, squatting and getting up from a chair/bed. Some people also experience crepitus, where they feel, or sometimes even hear, a cracking, grinding or popping sensation, when they move their knee. In severe cases when there is bone rubbing on bone, people may experience stiffness or the kneecap may get momentarily stuck, known as pseudolocking. Your doctor will start by asking you various questions about your symptoms and will then exam your knee to rule out any other conditions. X-rays are usually the simplest way to diagnose patellofemoral arthritis. Ideally a skyline or tangential view of the patella (taken from above the knee) should be taken to give the best view. In some cases you may be sent for a CT or MRI scan. Patellofemoral arthritis can be classified into four different stages. Avoid activities that aggravate symptoms as much as possible whilst still getting on with daily life. Use the hand rail when going up and downstairs, when sitting down or standing up take your weight through your good leg and if necessary use a stick or crutches when walking. Non-steroidal anti-inflammatory medication (NSAIDs) such as ibuprofen or Advil may be prescribed to help reduce pain and inflammation associated with patellofemoral arthritis. Strengthening and stretching exercises help to improve the strength, stability and flexibility of the knee which can help to reduce the pressure on the kneecap and thus reduce pain – they are one of the most effective treatments for patellofemoral arthritis. A physical therapist will be able to give you a rehab programme to follow specific to your needs. Exercises that place pressure on the kneecap, such as squatting, should be avoided. Swimming is a good option as it strengthens the muscles without placing weight through the joint, or opt for cycling over running. Visit the knee exercises section for a whole range of exercises that can help. Many people find that using either ice or heat helps to reduce pain and inflammation from patellofemoral arthritis. Ice has the added benefit that it helps to reduce inflammation – visit the ice wraps section to find out more. Losing weight can make a difference, but is only appropriate if you are overweight. This will help to reduce the pressure going through the kneecap. Talk to your doctor or a dietician before starting on a weight loss programme to ensure it is suitable for you. Corticosteroid injections can help to reduce patellofemoral arthritis pain and inflammation. A mixture of local anaesthetic and steroid is injected into the knee. They often give almost instant relief. Corticosteroid injections only help to treat the symptoms of arthritis, not the underlying cause so they should be used alongside other treatment methods such as exercises or else the pain is likely to return. You can find out more about how they work and the possible side effects in the knee injections section. Wearing a knee brace or taping the patella can help to support the knee and change the position of the kneecap. Visit the knee braces section to find the right brace for you. Glucosamine and chondroitin are popular supplements for reducing knee arthritis pain – visit the arthritis natural remedies section to find out more. If moderate to severe symptoms of patellofemoral arthritis persist for more than 3-6 months of non-operative treatment, surgery may be advised. There are a few different options depending on the severity of the arthritis, which parts of the joint are affected and the age of the patient. Suitable for mild to moderate patellofemoral arthritis. A chondroplasty is carried out arthroscopically (keyhole surgery). Small incisions are made around the kneecap through which thin surgical instruments and a small camera are inserted. Worn and frayed cartilage is trimmed and bone spurs smoothed out which both help to reduce friction in the joint. 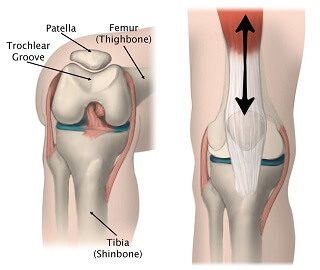 This involves shifting the position of the tibial tuberosity – a small bony lump on the tibia (shin bone) where the kneecap attaches via the patella tendon. With this type of surgery, the tibial tuberosity is removed, repositioned and then reattached with anchors or screws. This makes subtle changes to the position of the knee cap improving the tracking of the patella, allowing it to glide more smoothly in the trochlear groove therefore resulting in less stress and friction on the arthritic parts of the patella. Tibial tuberosity transfer tends to be done in cases where patellofemoral arthritis affects only a portion of the kneecap, seeking to offload the arthritic parts. Patella realignment surgery is done when tightness or laxity in the soft tissues means the patella doesn’t sit correctly in the trochlear groove which places excess pressure and friction on certain parts of the bone. With realignment surgery, the soft tissues around the kneecap are tightened or released to change the position of the patella in the trochlear groove. Examples of realignment surgery include lateral patellar retinaculum release, to release tight structures on the outer side of the kneecap, and reattachment or reconstruction of the medial patellofemoral ligament on the inner side of the knee. With this type of partial knee replacement, the worn and damaged parts of the patellofemoral joint are removed and the surfaces re-lined with prosthetic implants. The trochlear groove is lined with a thin metal plate, and a plastic “button” is attached to the back of the patella – both components are fixed on using bone cement. Patellofemoral replacement is only suitable if the arthritis is confined to the patellofemoral joint – if other parts of the knee are also affected, a total knee replacement is needed. Patellofemoral replacement surgery tends to be most suitable for younger patients and has the advantage of being less invasive than a total knee replacement. People often report the knee feels more “normal” afterwards, most likely due to the fact that the knee ligaments are all preserved. With cartilage grafting, the damaged cartilage is replaced with healthy cartilage either from another part of the knee or from a tissue bank. 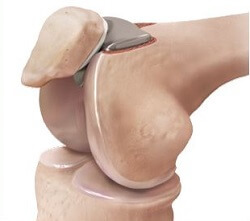 If cartilage is being taken from the person’s own knee, two operations are required. The first is to harvest the cartilage from a non-weight-bearing part of the knee, which is then sent to a laboratory where cells are cultured for 3-6 weeks to increase the number of cartilage cells. In the second operation, the new cartilage cells are transplanted back into the affected parts of the patellofemoral joint. Cartilage grafting is usually done in younger patients in an attempt to delay the need for joint replacement. 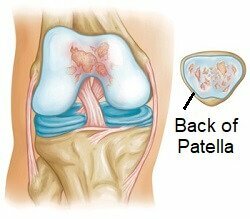 With a total or partial patellectomy, part or all of the patella is removed. It is only considered when there are no other options as whilst it may reduce pain, it inhibits the function of the quadriceps resulting in ongoing weakness. Whether you are suffering from patellofemoral arthritis or are recovering from surgery, exercises are really important to build up the strength and stability of the knee. Visit the knee pain exercises section for a whole range of strengthening and stretching exercises that can help. If you want to know more about how arthritis affects the other parts of the knee, including the causes, symptoms, diagnosis and treatment options, visit the knee arthritis section.